Mysuru: A small and simple event of Bengali songs took place on Sept.1 at the auditorium of International Youth Hostel, Gokulam. There were eight vocalists in total beginning with invited artiste from Bengaluru Shatabdi Das, an accomplished Rabindrasangeet singer, educated at Vishwabharati Santiniketan and currently a student of Shri Prabuddha Raha. She rendered some difficult numbers from ‘puja parjaay’ section of Tagore compositions with her voice appeal and dexterity — mentioning the context of each song before rendition. She was followed by Papri Bhattacharyya, a senior vocalist from Mysuru and student of Pt. Ajoy Charaborty, Bhaswati Shome trained in Hindustani classical and specialised in Nazrulgeeti and S.M. Sahadevan known for singing Manna Dey numbers. Shampa Sharma a newgen singer moved the audience with her folk numbers and Tapash Sankar sang Kishore-da! Shri Anandarup Bhattacharyya (a promising and talented tabla player) and Shri Pulak Mukherjee complimented the renditions with their tabla strokes. 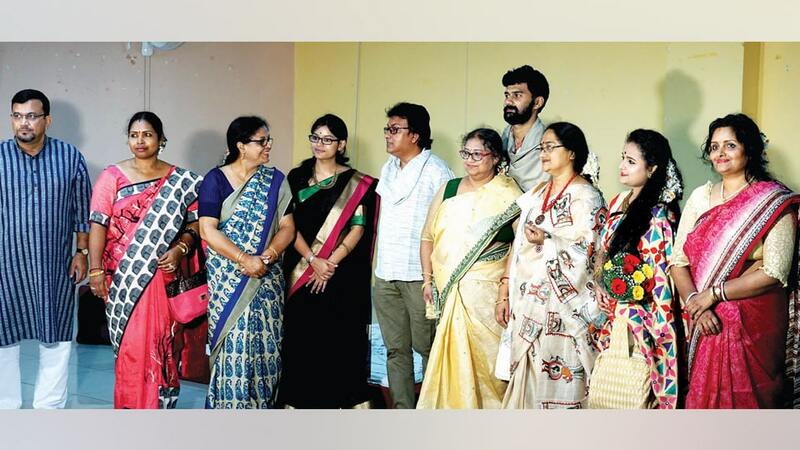 The high quality sound system added to the audio quality of each song and the audience, represnting two community groups in Mysuru (Bangiya Samiti and Bengali Association) remained engrossed with the broad spectrum of Bengali songs. The event was conceived and presented by Sharmila Ghosh. “It is surely a privilege to be hosting this kind of an event in the cultural capital of a non-Bengali State,” she admitted. A retired librarian from Delhi, she chose Mysuru as a post-retirement paradise along with her husband Dr. Hiranmay Ghosh, Advisor with TCS Bengaluru and Visiting Faculty for NIT-Karnataka.